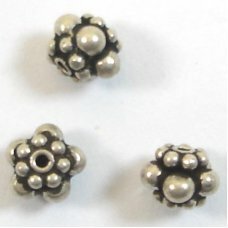 Sterling Silver beads are made from 92.5% pure silver alloyed with other base metals, mostly copper. 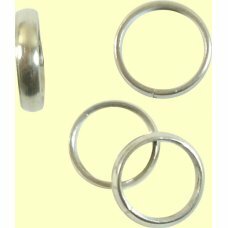 ?Although all are .925 sterling silver (STS) most are not marked, unless stated in the description..
10 Oxidised Sterling Silver Twisted Soldered Closed 7mm x 1mm Rings - great when you need something ..
1 Double Curved Spacer Tube 10mm 1.5 dia, sterling silver.. 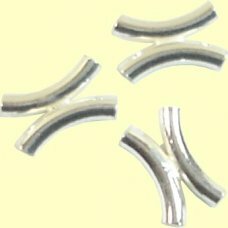 Wonderful sterling silv..
1 Double X Spacer Tube 10mm 1.5 dia, sterling silver.. Wonderful sterling silver double tubes,..
1 Double Spacer Tube 10mm with 3mm ring in the centre 1.5 dia, sterling silver.. 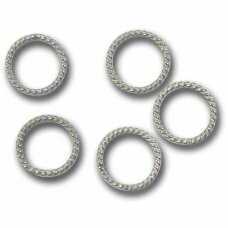 Wonderful ste..
1 Sterling Silver Twisted Soldered 8mm x 1.25mm Rings - great when you need something more secure th..
1 Sterling Silver Ring, approx 12mm outside diameter, 2.5mm wide, 1mm thick. Not soldered. 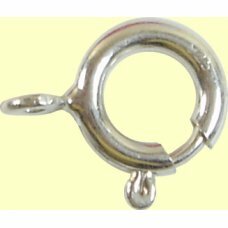 Sterling..
1 Bali Sterling Silver Hook and Eye Clasp, measures approx. 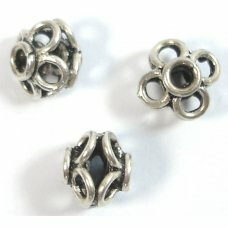 5 x 17mm (total length) - ultra tiny ste..
2 Bali Silver Chandeliers, measuring approx 12x23mm. Could be used either way up. 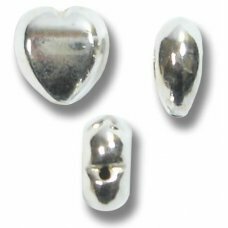 Sterling Silver i..
1 Sterling Silver Necklet Tags. Used to finish off bracelets and necklaces professionally by jo..
1 Large Sterling Silver Lobster Claw Clasp 14x5.5x3mm (jump ring excluded from measurement). Marked ..
1 Medium Sterling Silver Lobster Claw Clasp 12x4.4x2.7mm (jump ring excluded from measurement). Mark..
1 Large Sterling Silver Lobster Claw Clasp 16x6.5x3mm (jump ring excluded from measurement). Marked ..
1 Large Sterling Silver Lobster Claw Clasp with jumpring 16x6.5x3mm (jump ring excluded from measure..
1 Sterling Silver Crimpable Loop in Loop Clasp - this little clasp is joined link to link - you crim..
1 Sterling Silver split ring 5.2mm these are great to use as the connections for your Sterling ..
1 Sterling Silver split ring 4.7mm these are great to use as the connections for your Ster..
1 Sterling Silver 4-Row Spacer Clasp; pull gently on one end and this comes away to form the two par..
1 Sterling Silver Wave Design Pearl Clasp - a traditional clasp for pearl stringing type projects - ..
20 Medium Weight Sterling Silver 5mm Jump Rings. 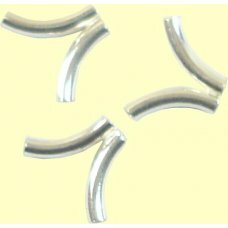 5mm outside diameter 0.7mm wire. 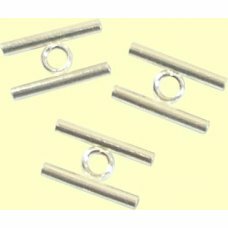 Sterling Silver i..
One 7mm Sterling Silver bolt ring clasps with closed ring for stringing. Marked 925. 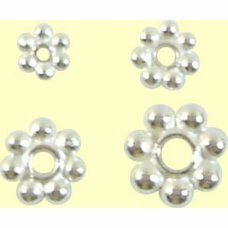 Also known as s..
1 Sterling Silver Twist Detail 'S' Clasp with Rings; the 's' clasp has one reinforced hammered end, ..
Sterling Silver Filigree Round Pearl Clasp. 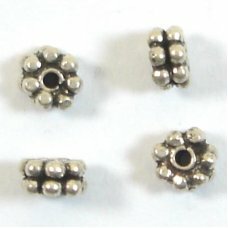 This is a traditonal clasp used with pearl stringin..
50 Sterling Silver Tube Crimps Large 2mm length 1.3mm hole. 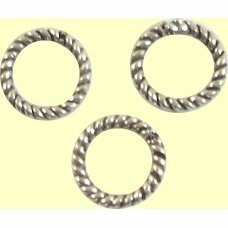 With a 1mm hole for multiple passes of t..
20 Heavy Weight Sterling Silver 6mm Jump Rings. 6mm outside diameter 1mm wire. Sterling Silver is 9..